A new printing of the 76p Machin stamp has been found. These were, of course, the M11L versions. Originally printed on 10/01/11 and 11/01/11, further printings were made on 12/05 and 31/08/11, and on 10/01/12 still with the M11L year code. All values exist with these dates. The final printing was on 30/03/12 from a new D2 cylinder and was a single-value printing! This was not announced by Royal Mail - indeed their list of printing dates shows this as being from cylinder D1 - and supplies are likely to be in very limited supply. UPDATE 27 September: We understand that the new printing was ahead of the new tariff for surface mail, which was to have been 76p; but that was increased to 77p so these were not needed. The surprise is, therefore, that ANY have been found at post office branches. Just to clarify, we have no stock of these cylinder blocks or grid positions. We are keen to acquire them for customers so if you have a PO branch that delays returning withdrawn obsolete stock, do check them out. The only reason to print these was because there was a need at POs so many have probably been used on packets or overseas letters. Is the D2 single-cylinder? There looks to be a faint DI above it - or is this a phosphor cylinder? 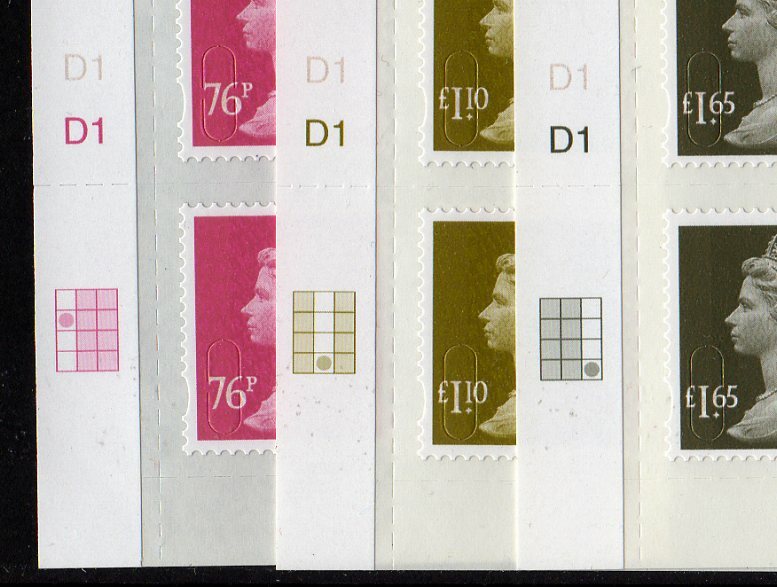 The D1 you can see will be the irridescent overprint, Mike. The D1 for phosphor will be higher still. The original 2011 printing of the three values (M11L coding) was spread across a single sheet with 76p = left hand column, £1.10 = middle column and £1.65 = right hand column. 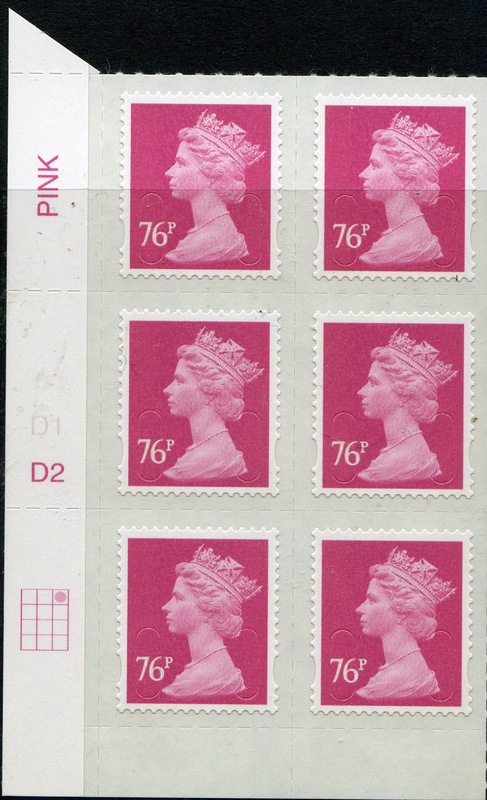 Due to the delay in the 2012 tariff increase a fresh printing occured on 25/01/12 with the coding M12L, in theory with the same layout across the sheet, however only instances of the 76p have come to light from that printing. On 30/03/12, still awaiting the tariff increase, a fresh printing of the 76p took place, this time using cylinder D2 and covering the whole sheet with 76p's, therefore potentially 12 cylinder blocks available. The three values 76p, £1.10 and £1.65 were all withdrawn from general sale including Tallant's House at end of April 2012. I have seen instances of the 30/03/12 D2 76p cylinders on ebay for £12.00! You've got it right, except that the three values were not withdrawn from Tallents House in April as stamps are always retained on sale for at least 12 months after their PO withdrawal dates. According to Royal Mail's latest Stock List received yesterday, those values and the 68p, will go off-stock on 29.3.13 - oddly NOT 12 months after their replacement date but 12 months after RM would have liked to have replaced them! The withdrawal date is 2 years after the issue date in this case. I would think £12 is a very good price. Interesting that they were also printing the 87p on 30/03/12. This is, of course the replacement for the 76p. Even more interesting that this was not even the first printing date for the 87p. They had already printed some on 08/02/12. A late printing indeed! Im looking on ebay for the 30/3/12 D2 76p cylinders but am having no joy. I think £12 would be a steal. Any idea how many have been printed? No idea. As indicated above I bought date blocks when the new date first appeared on a Royal Mail list that showed them as being from D1. Only the right-hand column was on offer, all four positions. It has been suggested that POs had been unable to order and were instructed to make up with other values (as they were with the 1st Large Diamond Jubilee), and that this printing wasn't delivered to POs but was for Royal Mail Business to supply large customers. Maybe a mailing house wanted to get a large mailing of 10g letters or postcards off to worldwide addresses. It doesn't seem that likely but then neither does any other explanation. Interestingly the ebay lot I saw on Wednesday is no longer there. Sadly I did not put it in my watch list either. I'm guessing it was a 'buy now' lot that was sold. Ian - Thanks for the info re: availability of the cylinders from Tallant's House, I was not aware of that. I will need to dip into my piggy bank/persuade my better half! Don't forget on eBay you can also look at completed listings, you should find it there if not too long ago. Some 76p D2 cylinders are currently being sold on eBay for £18.50 a block. Not a bad price? Some 76p D2 cylinders [first 4 rows] are currently being sold on eBay for £25 a block.